Celebrating International Workers Day: For Real this Time! No matter how much you may love your job, few things are more exciting than a day off. This Thursday, May 1st, many countries across the planet celebrate International Workers Day with precisely that…a day off. In Lebanon, the first things one thinks of on International Workers’ day is “rest”, “celebration” and “picnic with the church.” Each year, Churches in Lebanon have a tradition of planning a picnic out with the church members on the 1st of May. 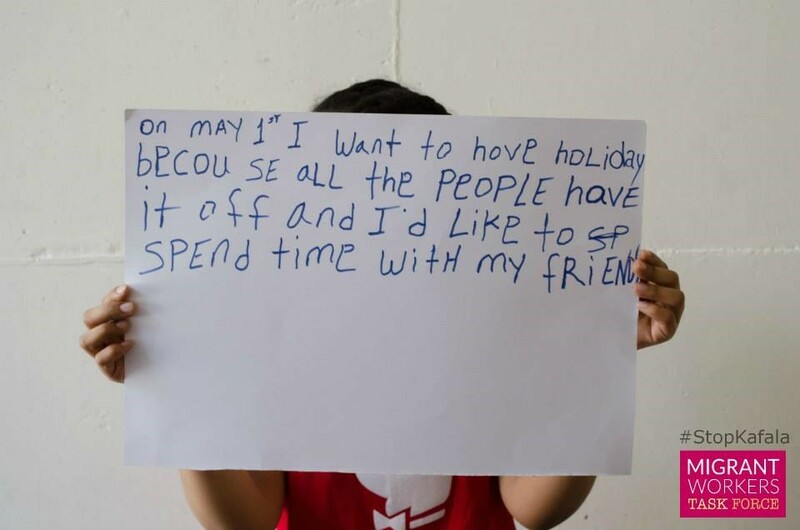 However, as our churches have been planning for their annual picnic, activists have been planning for the “Workers’ Day Parade and Festival for Migrant Domestic Workers.” As part of this campaign, migrant domestic workers in Lebanon write a message on a piece of poster board and post it on Facebook. One such message, seen above, made me ashamed of myself! I couldn’t but stop and think of the many migrant workers across Lebanon and the Middle East on International Worker’s Day locked up in their madame’s house!! I recalled Martin Accad’s blog post from last week, “My Journey To hell and Back,” as I reflected upon the fact that while I will be enjoying a day off as a “worker,” slavery is still very much prevalent in our world today. It simply has a new name. According to the 2008 Trafficking in Persons (TIP) Report an estimated 12.3 million people are enslaved around the world today. It is the fastest growing criminal enterprise in the 21st century – a nine billion dollar industry. To learn more about migrant domestic workers in Lebanon you can follow my colleague Wissam Al-Saliby’s blog: Ethiopian Suicides. I Am Not Like Them! I mentioned above that we can be part of the slavery system, although how? But when I looked within, I found myself guilty! For instance, when a new person steps into our church, we often get excited, give them attention, run to salute them, check up on their spiritual status and figure out how we can be of a help or support! However, if a domestic worker steps into our church, are we ready to run to them, salute them, see if they have been told about Jesus and if they know about God’s love for them? Do we care about them becoming part of the body of Christ, integrated within our local community, or becoming actively involved in ministry? Although I do see Christians treating their workers kindly and with love, most of the time I see the domestic worker sitting in the back while few, if anybody even notices her! A domestic worker is brought with her ‘madame’ to watch over the kids and is never expected to sit in the front seats! She is never evangelized or asked about her salvation; she is not actively considered as another sister. I was recently inspired by one Sri Lankan woman who attends our church named Champa. She has been here in Lebanon as a domestic worker for many years, and with time she started feeling sad for her Sri Lankan sisters who need to hear and experience the good news of the gospel, but do not have any church meetings in their mother tongue. So rather than remaining sad, she took the initiative! She contacted a pastor from her church in Sri Lanka to ask him if he would be interested in pastoring the Sri Lankan expat community in Lebanon, and then communicated the idea of starting a worship service with our church. I wish I had the same heart she has for her people! In conversation, some friends of mine keep using Bible verses claiming that the Bible does not abolish slavery, even claiming that the Bible actually supports it! For example, they site the verse in Ephesians 6:5 “Slaves, obey your earthly masters with respect and fear, and with sincerity of heart, just as you would obey Christ.” But does this mean Paul is promoting slavery? By no means! Paul is simply encouraging his brothers and sisters who have come to know Christ and experience His liberty, but are still considered slaves under the existing ancient Roman imperial system, to take heart and be faithful to their work and act out of love until the day the system changes…but also to make the most of every opportunity to obtain freedom when possible! (1 Corinthians 7:21). In his letter to Philemon, Paul writes on the behalf of Onesimus, a former slave of Philemon who had left him. Paul pleaded with Philemon to receive Onesimus back “no longer as a slave, but as a brother beloved,” delegitimizing and challenging the entire institution of slavery in the process. For how does one enslave his brother? On this day, therefore, I would like to stand in respect for all my migrant worker friends in Lebanon. This is, after all, their day! I Am Against Modern-Day Slavery! What Can I Do? We can pray for God to move our hearts towards the level of action and not remain stuck at the level of sympathy, and that we might stand by those who mourn and are subject to oppression. 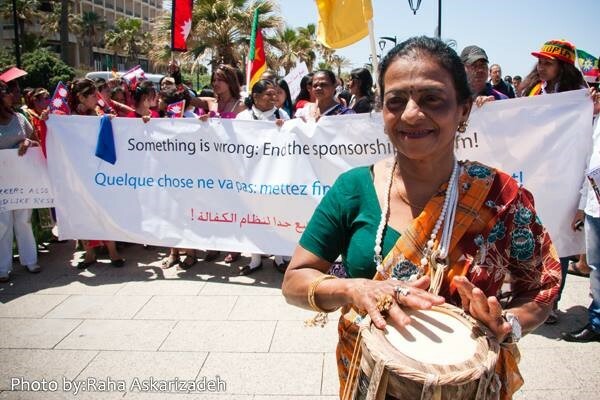 Those of us in Lebanon can join the Migrant workers parade on the 2nd, 3rd, and 4th of May. We can encourage our sisters and brothers in humanity who are migrant workers. We can perform daily acts of kindness and mercy for domestic workers or the men from Bangladesh who fill our cars’ gas tanks. We can become informed about the situation of migrant domestic workers and learn more about the campaigns and actions taken to help improve and/or challenge the system that manages the rights of migrant workers in Lebanon.